Its Hazel from Didos Designs here with a cute wee Peeking Easter Friends Tag and Card to share. 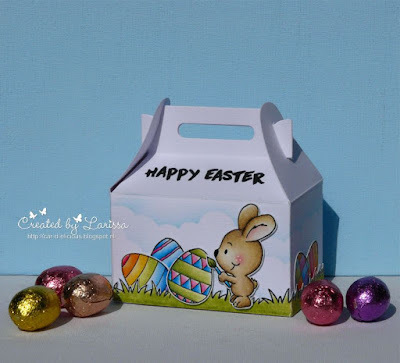 I made these for my sons girlfriends birthday this week even though they are Easter images, you can use them all year round!! They are sooo cute!!! They are really versatile as you can see from my creations. I have added the great wee picket fence from the Hoppiness Stamp Set and also on the card the butterfly and hearts from the same set. For my colouring I have used cotman watercolour paints. I fussy cut the animals and popped them where I thought they would like to peek out from. You can buy the dies for this set here though to save on the cutting out. Today, I am sharing a card as a guest designer featuring the newly released, Wheek, Wheek, Wheek stamp set. 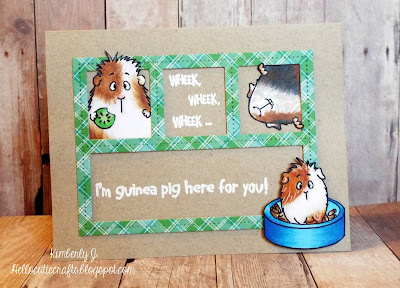 The set has some really adorable guinea pigs and sentiments. 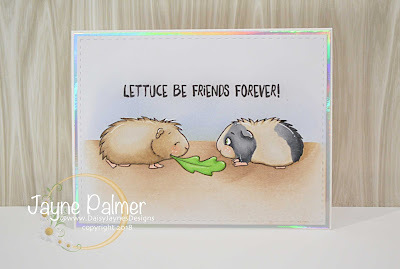 I started the card by stamping and copic coloring the fun images from the Wheek, Wheek, Wheek stamp set (Aren't they adorable??). Next, I fussy cut them out. I die cut the pierced frame from some Perfectly Plaid Christmas paper by Lawn Fawn, then I arranged the cute guinea pigs in and outside the frame. I added the frame and images to a desert storm (Neenah) card base. Then I stamped the two sentiments from the set in versamark ink and heat embossed it in white. I added some gel pen details and glossy accents to a few places. Its Hazel from Didos Designs back again with more of the super sweet Peeking Easter Friends. 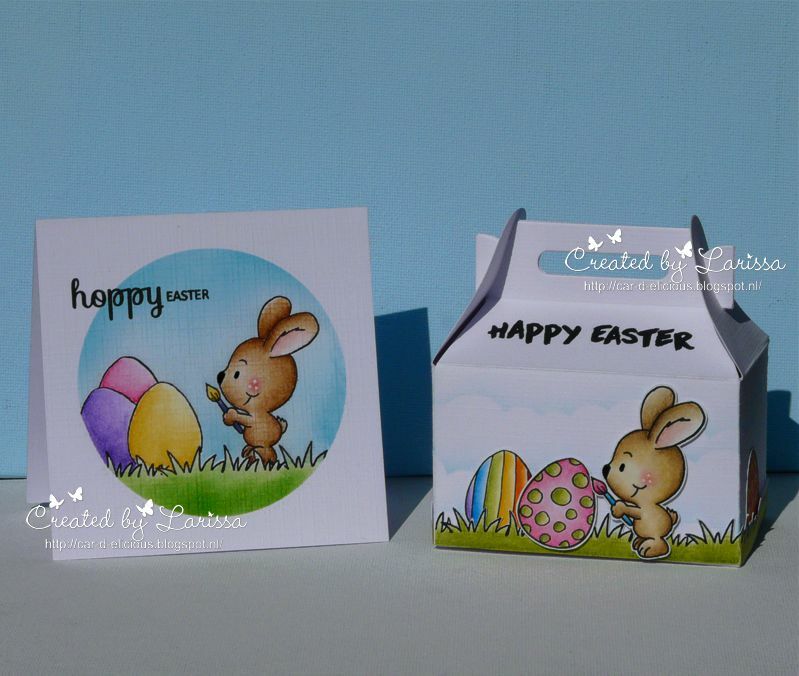 Today I have used 2 of the bunnies from the set with some Easter Eggs too. 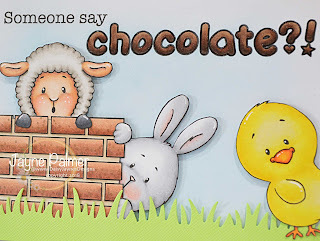 I coloured the background and the rabbits with cotman watercolour paints and cut them out. There are some amazing dies that go with this set. They are available here.here. Much quicker and better than my fussy cutting!! I mounted the bunnies using some diecut grass and a frame background with the moon shining down for a finishing touch. 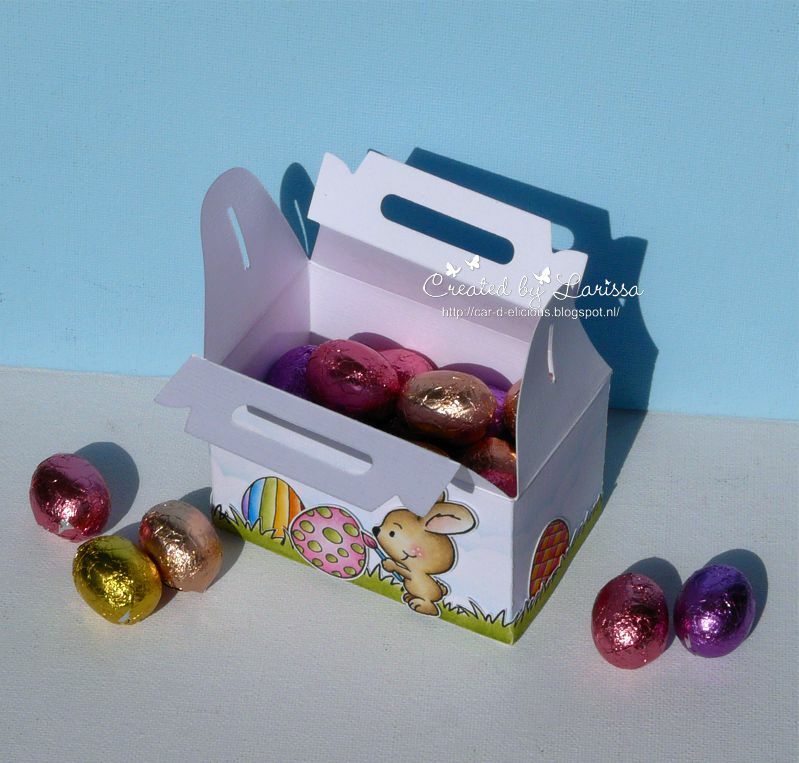 Im sure the wee bunny peeking in is about to snaffle the other bunnies collection of eggs!! Goodmorning, I am Larissa from Car-d-elicious and today I am posting a new card on the blog from Gerda Steiner designs and because easter is coming versy soon, I decided to make an easter card. 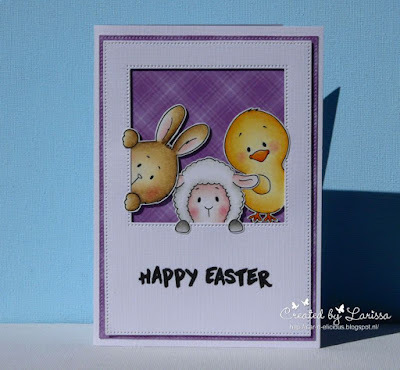 On my card I have used the stampset Peeking easter friends from Gerda Steiner designs. 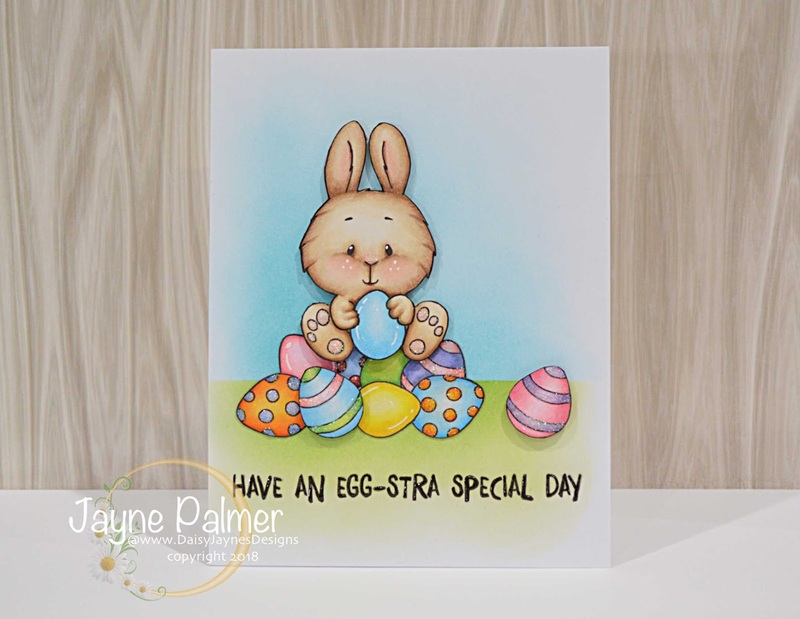 I stamped the little bunny and on a sheet of white cardstock I stamped an egg-background with all the egg stamps that are in the stampset. 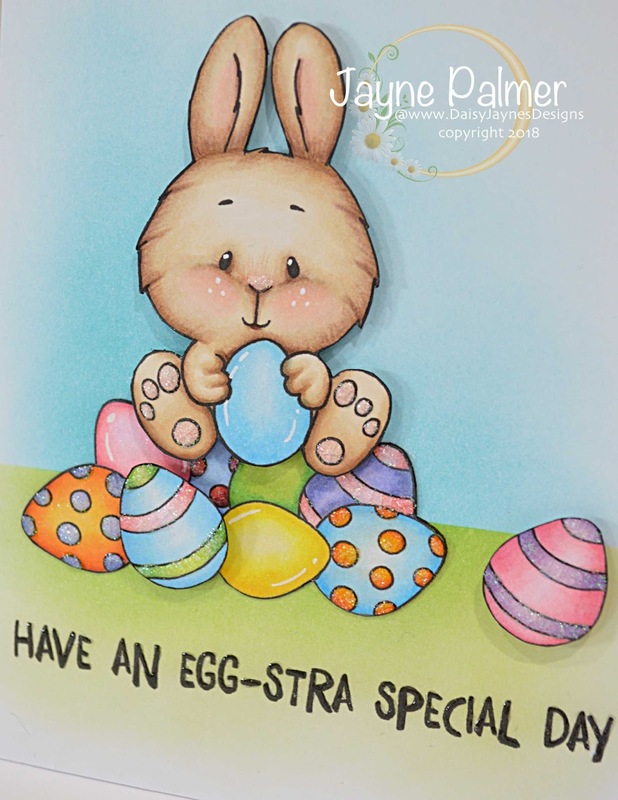 I have coloured the bunny and the egg-nackground with my Polychromos pencils. 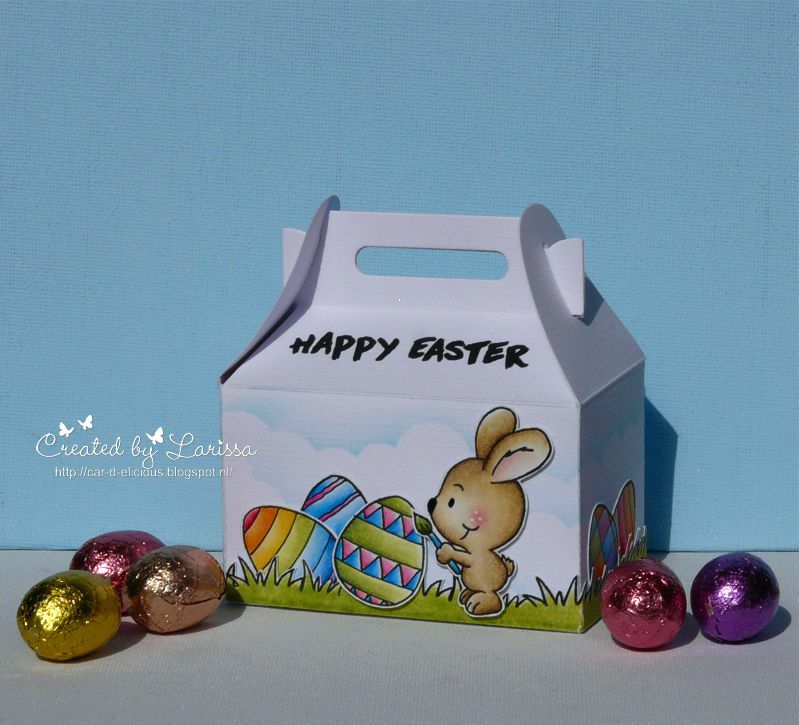 I used a black glaze pen to colour the eyes of the bunny and I applied glossy accents on his feet. Then I have fussy cut the bunny. From white cardstock I have die-cut a circle with the Crea-nest-lies XXl 41 from Crealies and I made a background for the image on it with the Drifts and hills stencils from My favorite things with Tumbled glass and Mowed lawn distress ink. I have cut a larger circle from balck cardstock with the Crea-nest-lies XXL 49 from Crealies and I adhered the white circle on top of it. I have die-cut the egg-background with the Crea-nest-lies XXL 44 from Crealies and after I adhered it on black cardstock I adhered it on a kraft card. I have adhered the circles with foamtape on the card and then I placed the bunny on the circles. 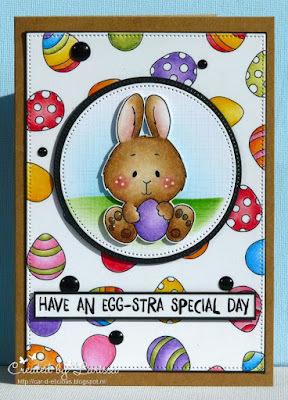 The sentiment is also from the stampset Peeking easter friends from Gerda Steiner designs. Then I decorated the card with black enamel dots. Hey there! Today I'm sharing another card using the Peeking Easter Friends. I still can't get over how cute this set is and I just want to take advantage of the animals peeking, so I used a die cut that had some borders for peeking purposes. This worked perfectly for this set. It has three main windows and a top window for the sentiment. 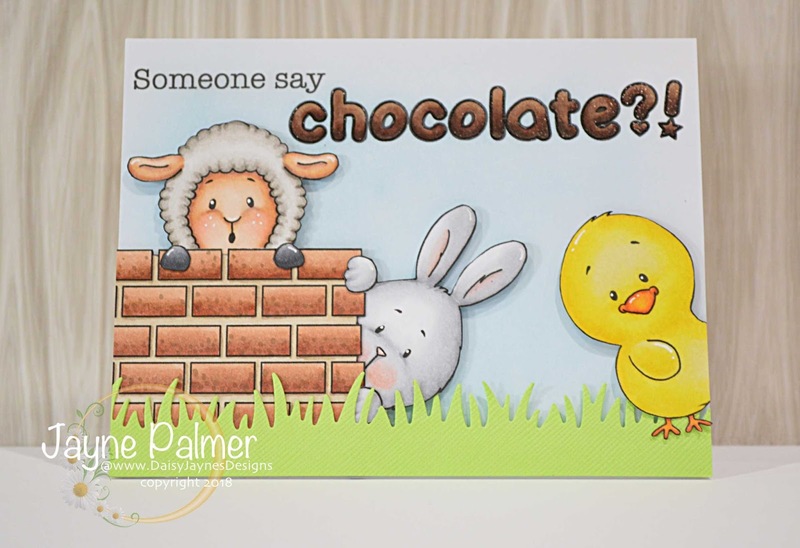 For this card, I had to fussy cut these images so it looked clean so both the bunny and the sheep can have their paws over the border. Once everything was colored and cut, it was quick to put this together. 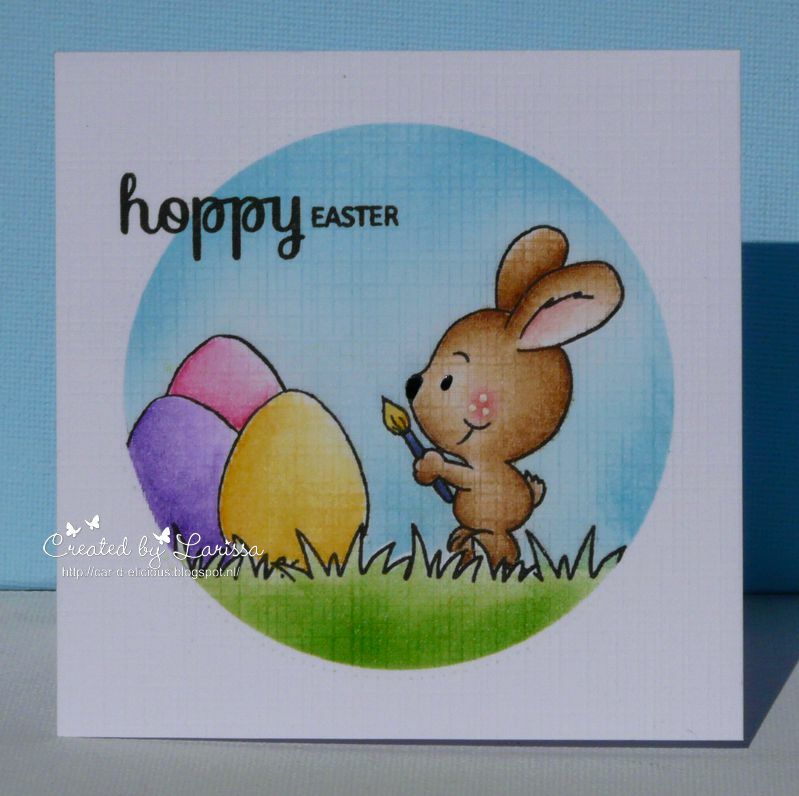 I added a couple of layers of cardstock so there was color to the card. Have you picked up this card yet? I'm so excited to see what everyone has made with it. Hope you enjoyed this card and I'll see you next time! 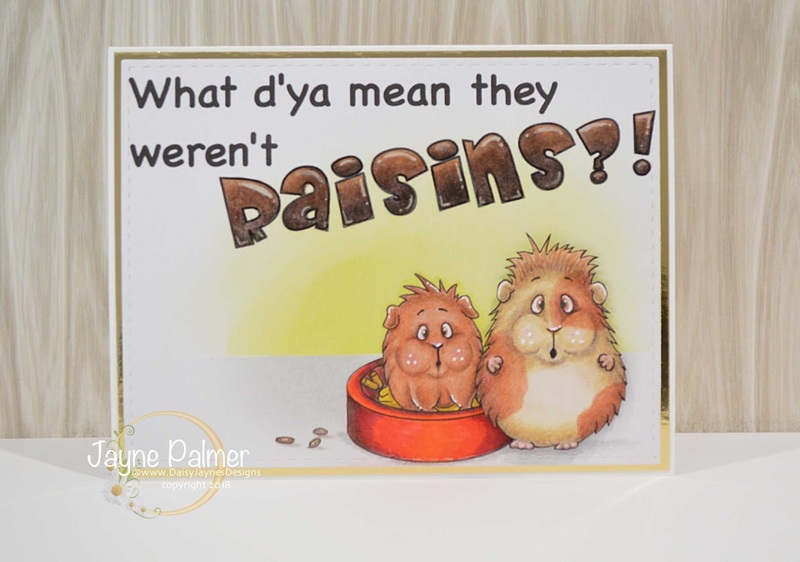 Hello everyone, Jayne here from Daisy Jayne's Designs. 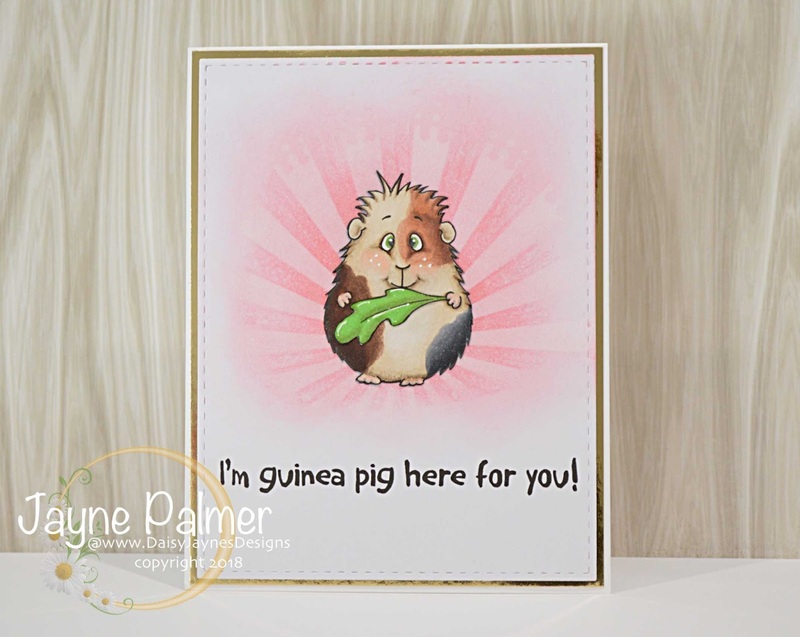 Today I would like to share with you four cards I have made using the new Gerda Steiner stamp set ' It's Guinea be ok'. 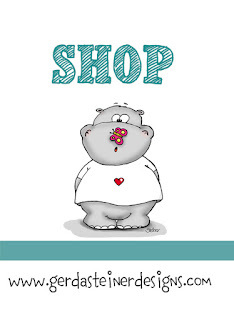 The sentiment has been designed in my Cameo software and printed on 5.25"x 4" white cardstock. 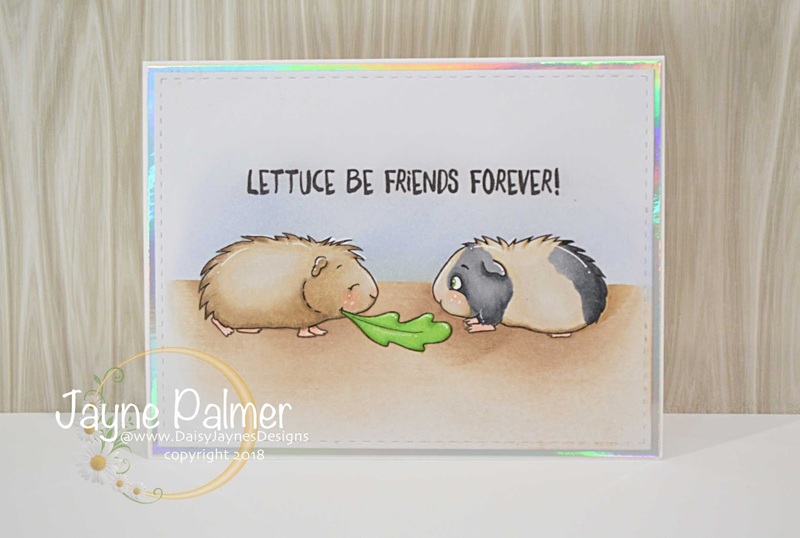 The Guinea pigs have been stamped in a Copic friendly ink and coloured with Copic markers. I used coloured pencils to add depth and dimension. The raisins (?) have been drawn in by hand. The background has been coloured with Distress inks. The larger Guinea pig has been popped up on foam tape for added dimension. The card panel was layered on to gold mirror card. 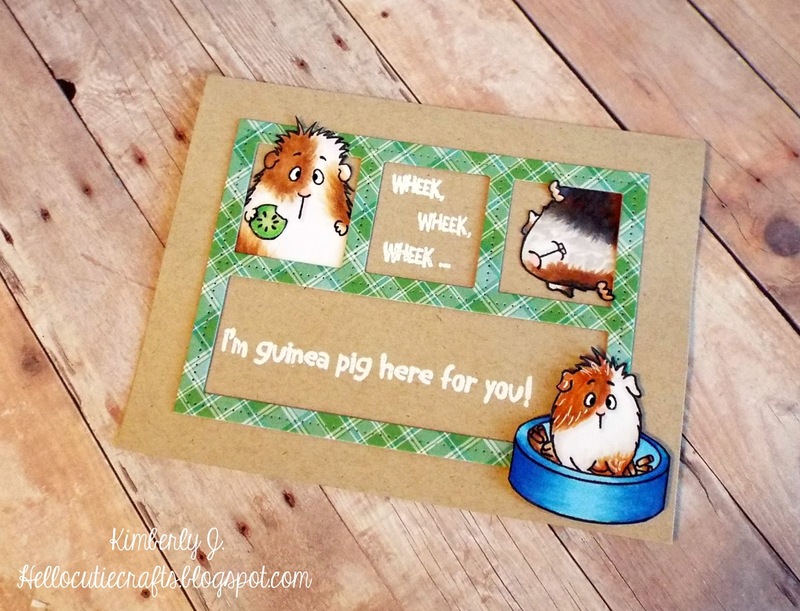 The Guinea pigs and sentiment were stamped in a Copic friendly ink and coloured with Copic markers. The background was coloured with Distress inks. The card panel was layered on rainbow mirror card. 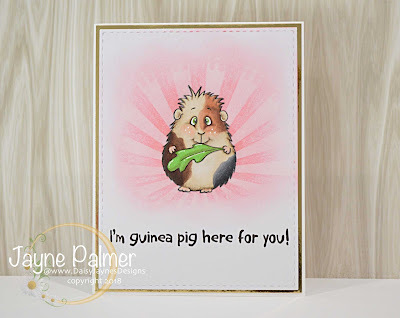 The Guinea pig and sentiment were stamped in a Copic friendly ink and coloured with Copic markers. The background effect was stencilled with white pigment ink. The card panel was layered on gold mirror card. 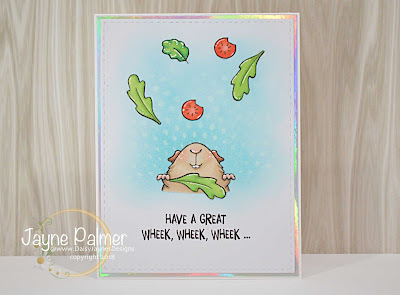 The Guinea pig, salad and sentiment were stamped in a Copic friendly ink and coloured with Copic markers. 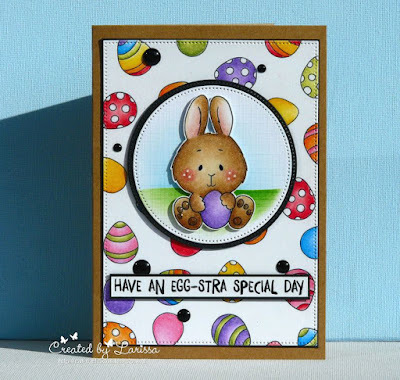 Goodmorning, I am Larissa from Car-d-elicious and today I am posting a card for the monthly challenge from Gerda Steiner designs. 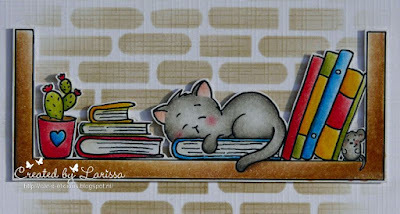 This month you have to make a card with the image Cat in bookshelf from Gerda Steiner designs. If you make a card for the march challenge, you automatically get the april image emailed to you. I have coloured the Cat in bookshelf from Gerda Steiner designs with my Polychromos pencils and then I have fussy cut the image. 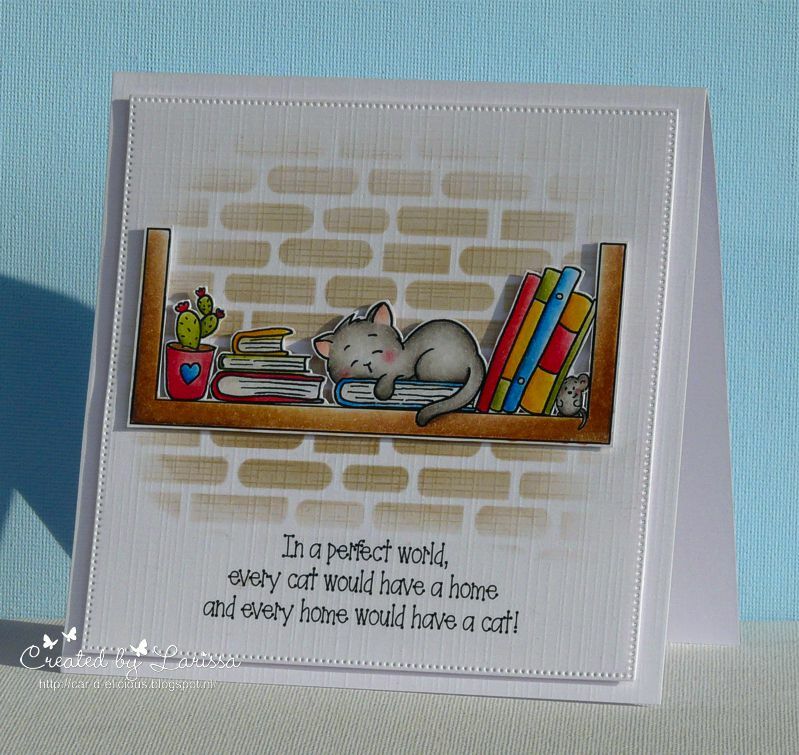 I have searched on internet for a purrfect ;) sentiment and after I found it I printed it on white linen cardstock. 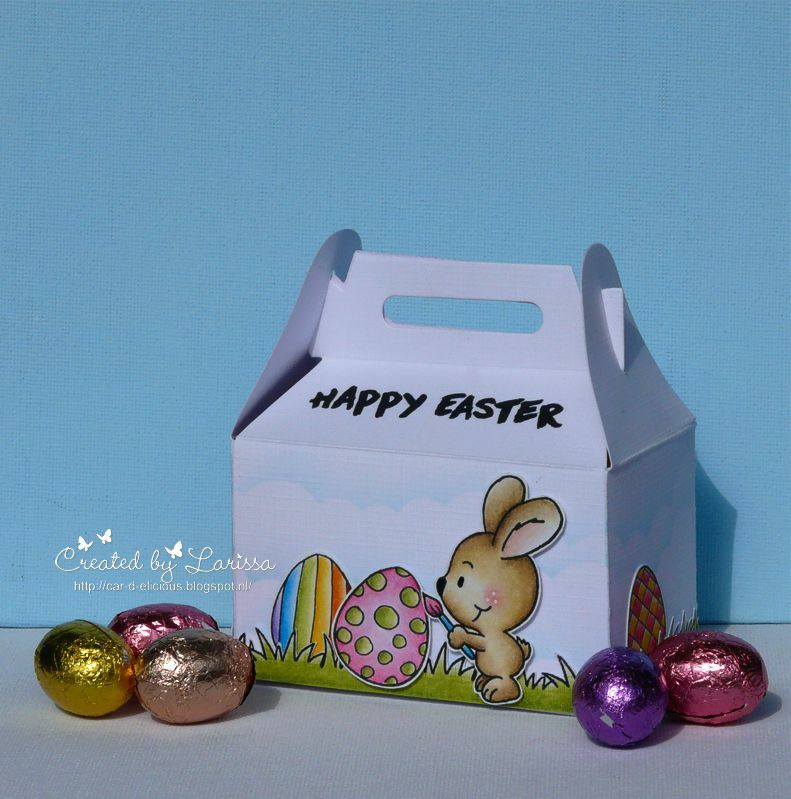 I have die-cut the sentiment with the Crea-nest-lies XXL 42 from Crealies. I used Frayed burlap distress ink and a wall stencil to create a wall on the white square. I have adhered the image with foamtape on the wall and then I adhered the white square on a white card. When I saw this stamp set, it reminded me of one of my favorite GSD sets, Hoppiness. Unlike the Hoppiness set (where there's a fence), I needed to create something for the animals to be peeking from so I came up with a border of eggs, using the three from the set. I used full adhesive post-its to create masks for the three eggs and I stamped them on a piece of A2 paper until I had a full border. 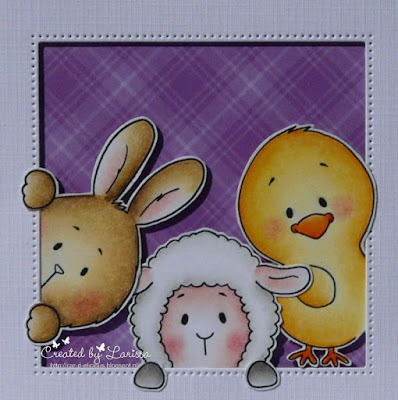 Afterwards, I wanted to stamp the bunny and the duck directly onto the border, but I realized that I should have done that first. The trick with masking is that you have to stamp the images you want in the front first. I ended up having to fussy cut the border, and the animals. Once I had my animals, I added them to the border. I debated whether I wanted to just do a flat or a dimensional card. Since the eggs had so much color to them, the colored cardstock seemed a bit plain for a background. I don't think you can tell from the photo but I embossed the background with a flower font, fitting of the Easter holiday. But even with the embossed background, it still looked plain to me, I decided that making it into a shaker card would liven it up. I added two layers of foam tape on the border, acetate to the front, and shaker bits in the middle. 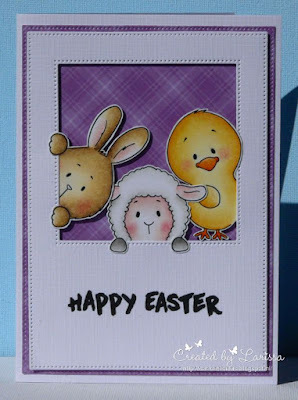 For the sentiment, I stamped in Happy Easter and added it to the front. I'm pretty happy with how this turned out. It's bright and colorful, just like spring time. I can't wait for the weather to get warmer! 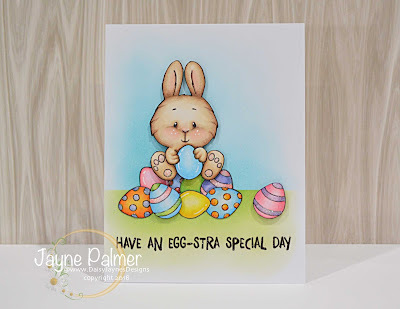 Thanks for stopping by to see how I created this card. I'll be back next week to share another card using this set in a different way. Until then! 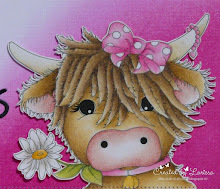 Hello everyone, Jayne here from Daisy Jayne's Designs. Today I would like to share with you two cards featuring the new Gerda Steiner stamp set 'Peeking Easter Friends'. The bunny has been stamped in Momento Tuxedo Black Ink and coloured with Copic markers. I then fussy cut him/her out and ran a black marker around the edge. 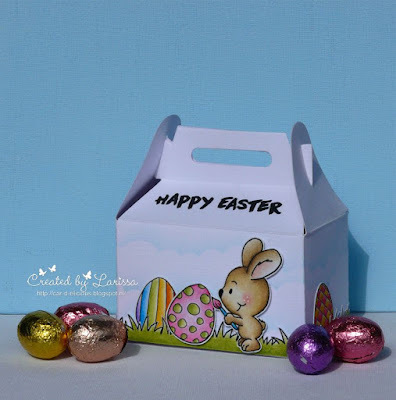 I stamped and masked the eggs to create an egg pile for the bunny to sit on. 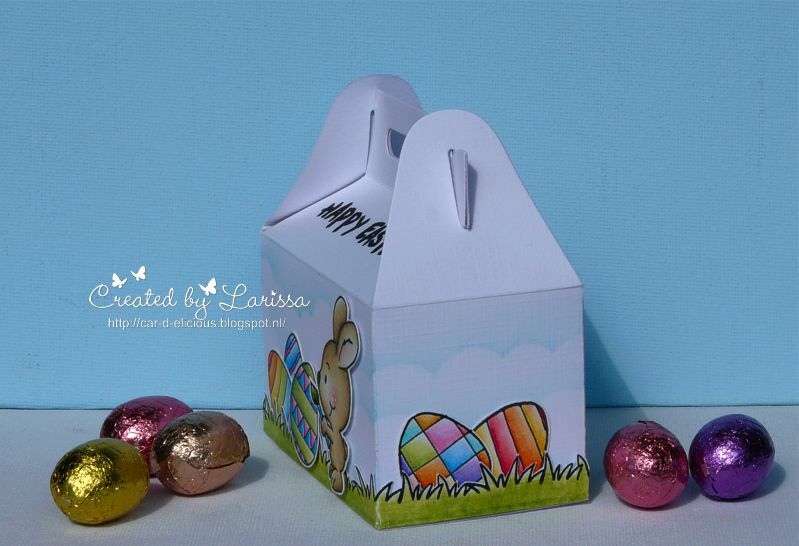 The bunny and two of the eggs have been popped up on foam tape for added dimension. The background was coloured using Distress inks. The sentiment has been stamped in Versafine Onyx Black Ink and heat embossed using a clear fine detail embossing powder. 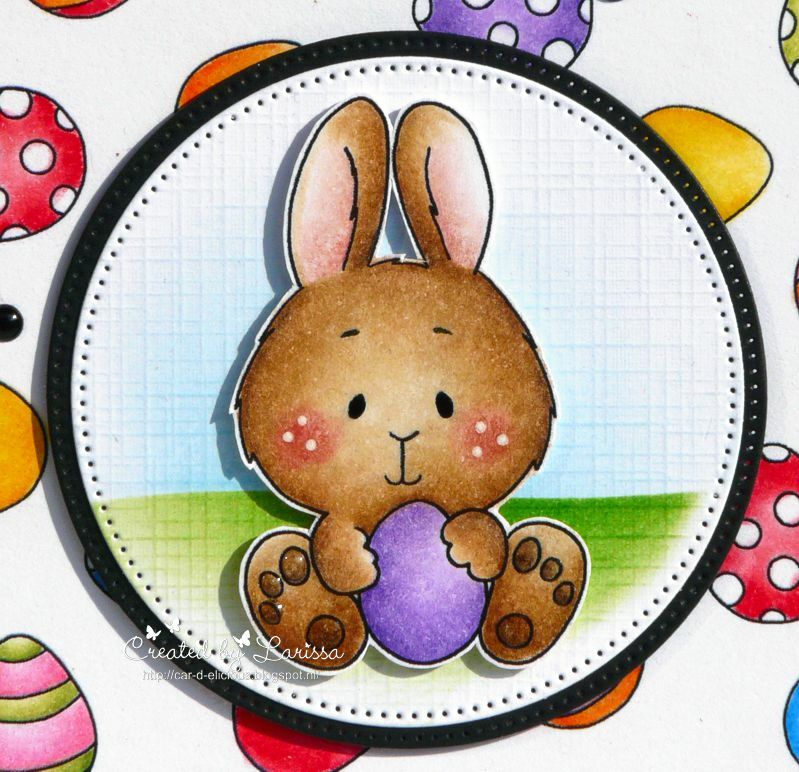 I have used a white gel pen to create highlights on the bunny's cheeks and the easter eggs. Card #2 Someone say CHOCOLATE?! 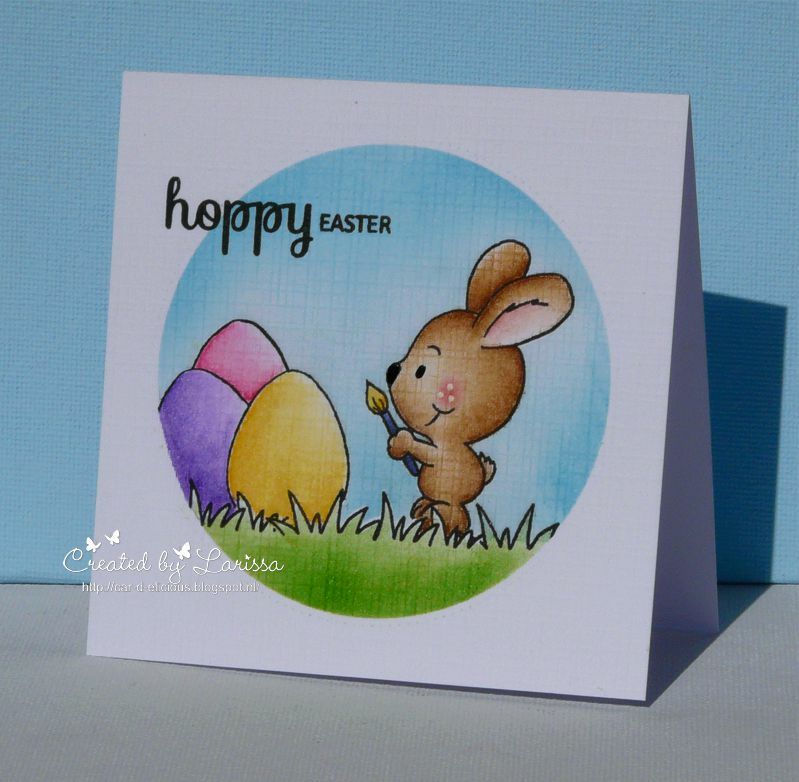 The Easter Friends have been stamped in Copic friendly black ink and coloured with Copic markers. They have been fussy cut out and a black marker run around the edge. 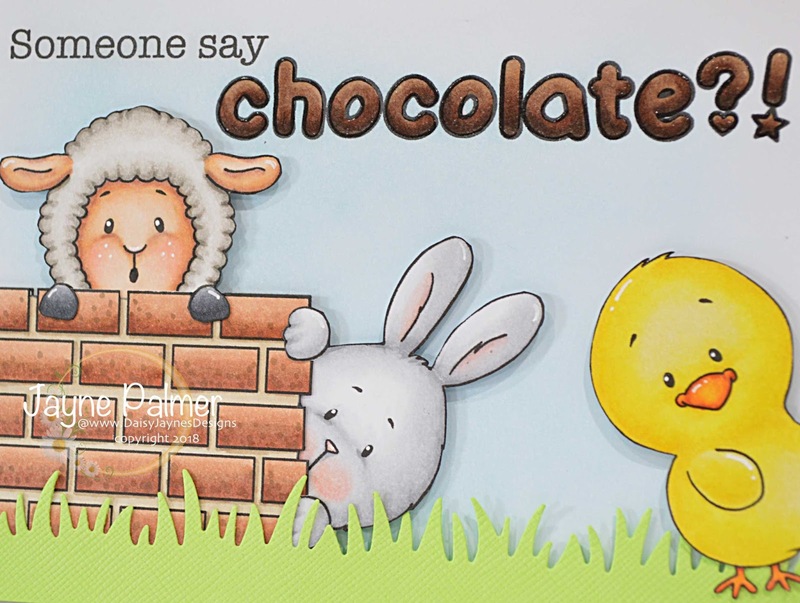 The brick wall and sentiment was designed in my Cameo software, printed, coloured with Copics and fussy cut out. The critters and brick wall have been popped up on foam tape for added dimension. 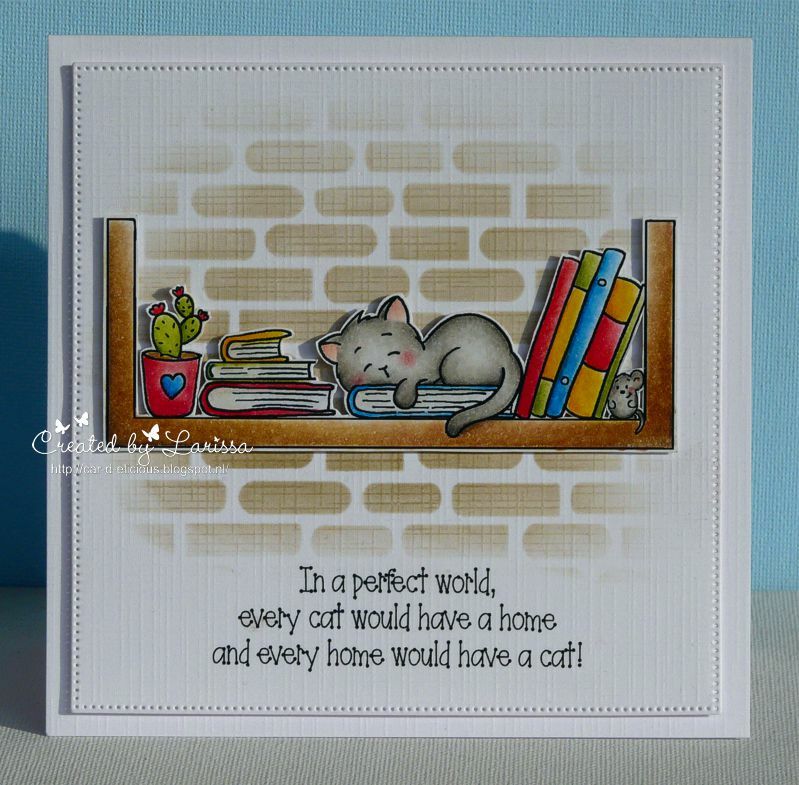 I have added a die cut grassy border, also on foam tape, and the background had been coloured using Distress ink. I have used a white gel pen to add some highlights. I hope these cards inspire you.